Every April, every year it is IBS Awareness Month worldwide. Last year I was personally involved supporting IBS Awareness Month (2017) by providing advice on the talkhealth ‘Online clinic on bowel issues & IBS’. This online clinic is something talkhealth organise every year and you can follow the link here for more information about this years (2018) online clinic where a range of medical experts will be available to answer questions on issues surrounding bowel incontinence, bowel cancer, constipation, IBS and any other bowel issues. Wherever you live in the world please try to get involved with your local IBS charities or organisations to support IBS Awareness Month. In the UK we are lucky to have the excellent charity the IBS Network who advocate and encourage more research, improved education and promote effective self-management for those with IBS. It was around this time last year that I became more involved with the IBS Network and I volunteer my time with the charity as a member of their panel of experts. This means I often answer questions from members of the IBS Network which are either replied straight back to the individual or presented in newsletters sent to members like the one below. The low FODMAP diet is an evidenced based dietary treatment for the symptom management of functional gastrointestinal disorders such as irritable bowel syndrome. As described below the diet is split into three parts. The completion of all three parts will provide the knowledge and empowerment to gain control of symptoms for the long term. So far so good but unfortunately as information on the diet has increased via media channels and the internet, parts two and three seem to have got lost. This can happen when these types of sources pick and choose the information they want to present rather than providing the full picture which a health professional always will. Instead all the focus has been on following part one; a diet low in FODMAPs. This could lead a great number of people attempting to follow a restricted diet for a sustained length of time completely unnecessarily and completely unaware that this is not the correct thing to do. So what is the problem with the word ‘low’ in FODMAPs? Many people in the scientific community were dubious of the name from the start. It was a poor choice of words. We already had the low fat, low carb and low sugar diets and then we got the low FODMAP diet, which does not reflect the entire nature of the diet. At least it was not labelled the FODMAP free diet. Recently the original research group, Monash University, who coined the term when developing the diet have even adapted their logo to remove the reference to ‘low’ within the FODMAP diet. Preferring to keep the use of the word low for their low FODMAP certified food product testing programme. Perhaps the term low FODMAP has contributed to some confusion over what the diet actually involves. This is because the diet is actually a three part diet and the only part of the diet which is low in FODMAPs is the first part. The first part is also the shortest part of the diet lasting from 2-8 weeks with most people finding the optimum reduction in symptoms after 2-3 weeks. This first part of the diet advises you to restrict your intake of FODMAPs to a low level to see if this reduces your functional gastrointestinal symptoms to a low level at the same time. In this instance the ‘low FODMAP diet’ can be looked upon as a diagnostic test to determine if FODMAPs trigger symptoms. If your symptoms reduce by going low FODMAP then it is a clear indication they are triggers. If you have followed the low FODMAP diet for 4 weeks and have not seen any reduction in symptoms then you should stop as this is a clear indication that FODMAPs are not a main trigger of your symptoms. Knowing that FODMAPs do trigger symptoms is only one third of the solution. What do you do then….avoid FODMAPs forever? Never again eat a cheese and onion sandwich, a cherry pie, or avocado on toast, or even an apple? This is of course where the other two thirds of the solution come in. The second part of the low FODMAP diet is the reintroduction phase which lasts between 6-10 weeks, although can be longer depending on symptom reoccurrence or life simply getting in the way. The reintroduction phase helps you determine which FODMAPs trigger your symptoms and at what portion sizes you can consume foods high in FODMAPs before symptoms are triggered. This is where you work out your tolerance to individual FODMAPs using a series of high FODMAP food challenges. Once you know which FODMAPs do and which ones do not trigger symptoms you can gradually bring them back into the diet to your own tolerance levels. By doing this you come to the final solution where you can once again eat foods high in FODMAPs, although clearly not as much as before when you had symptoms. Instead in the third and final part of the diet you consume a modified FODMAP diet, not low and not high in FODMAPs, but simply modified. This is a long term diet you can adapt over years gradually working out your overall tolerance threshold to multiple FODMAPs consumed in the diet. If you hear someone discussing the benefits of a low FODMAP diet remember the low bit is but one small piece of the pie…. hopefully a cherry one if you can tolerate it. When we are talking about the FODMAP diet we should be ensuring people are only low in FODMAPs for as limited time as is necessary as recommended by the expert dietitians who continue to develop, research and educate people on the diet. During this month on bowel health let’s make sure we are not restricting our intake of foods any more than we need to. If you are unsure how best to test your tolerance levels to FODMAPs or indeed other foods then please speak to a dietitian. Good news! 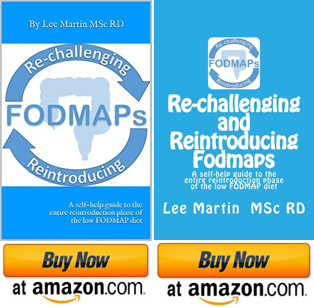 The first ever book dedicated to reintroducing FODMAPs is now available to purchase on Amazon. The book is titled ‘Re-challenging and Reintroducing FODMAPs – A self-help guide to the entire reintroduction phase of the low FODMAP diet’. Click on the logo for more details. A far bigger problem that the word “low” was using the notion of gluten free in conjunction with the word FODMAP .. at least the word “low” implies “reduced” but not completely eliminated. We spend endless amounts of time in our support group explaining that FODMAP diet is not a gluten free diet. It would helpful if they would remove this term too – it cause far too much confusion!